THE PICKIEST EATER IN THE WORLD: MIGHTY QUINN'S NEW BBQ BURGERS AND RICE BOWLS! When I first tried Mighty Quinn's at SM Mega Fashion Hall, I was instantly blown away but their mouthwatering BBQ dishes. Being the ever imaginative Burger Lover that I am, I couldn't help but wonder how these lip-smacking meats would taste when tucked between two buns. Rina, on the other hand, would never fail to add rice to her meals, making me think what a Mighty Quinn's Rice Bowl would look like. Well, Chef Lee Jose of Mighty Quinn's must have been listening, because he made my wishes come true when he launched Mighty Quinn's new BBQ Burgers and Rice Bowls! Everything you love about Burnt Ends is still there in the the Burnt Ends BBQ Burger (P280). This time tucked between a toasted Brioche Bun with pickles to offer a light touch of acid to cut through the meat's savoriness. The Pulled Pork Burger (P250) worked beautifully as a burger as well.. 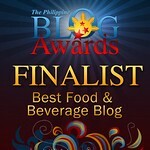 But my personal favorite had to be the Beef Brisket BBQ Burger (P300). It's the smokey meat that seems to melt in your mouth that just really wins me over every single time. Though I'm a fan of any of Mighty Quinn's BBQs with Dirty Rice, creating these rice bowls were pure genius. Every component in the bowl was well thought of, perfectly complimenting the flavor of the meats, with the side of Pinakurat vinegar serving as the cherry on top that surprisingly ties the meal together. But again, it was the Beef Brisket Bowl (P385) that got me salivating. For large groups, there are several platters you can choose from. We tried the Chicken and Pork Belly Platter (P1,480), which comes with with two sides, three servings of rice (Your choice of Garlic or Dirty), bottomless drinks, pickles and slaw. That's a half pound of food right there, so I think it can serve at least 6 people. The new dessert in their menu, the S'Mores Bread Pudding (P195) will be your latest addiction. The blend of chocolate with melted mallows, and the graham crackers shards adding more texture.. It's absolutely fantastic. We had a wonderful time, feasting on the new dishes of Mighty Quinn's! They were a absolute hit, creating affordable meals that definitely cater to the taste buds of the Filipinos! Like Mighty Quinn's Philippines on Facebook!